This is my belated birthday cake, shot both light and dark, apropos of my 30 years. My birthday was this past Tuesday, and I always imagined it would be an event. It wasn’t, and I didn’t want it to be. I worked all day, cried hysterically at one point (birthday’s are weird like that, I think), and had a wonderful supper with my family at St. John’s (which is where I always go & is still the only place I know of in Chattanooga to get a proper piece of foie gras or something like panna cotta with borage in it…). I didn’t cry because I was freaked out to be turning 30, it should be noted. I cried because I’m sensitive and in the habit of crying a lot (which if you’ve watched me on Masterchef you may have noticed). I’m cool with that. Quite the contrary, I’m elated to be in my 30’s and have been looking forward to it for two years now. My twenties were a horror show save these past two sweet years. I associate the past decade with wild self-obsession and a frivolous pursuit of identity through a pair of unbecoming glasses & owning The Wipers on vinyl. I was like that, I admit. While I still love my records & a fine pair of slacks, I am neither a constellation of dusty records nor my accoutrements nor the sum total of men in slim cut pants that want to make out with me in some dive bar besotted on PBR. So, you can imagine how terribly excited I am for the next decade of my life, far removed from all that nonsense. Though not without it’s bouts (frequent bouts?) of hysterical tears, I have a life I love. Purpose. A career I’m passionate about. A cozy home (that I hope to share corners of with you soon…as I’ve been doing much nesting lately!). And above all, a partner. A real partner that I love through thick & thin and probably the only man equipped to love the likes of me. I’m not all waffle cakes, people. But I do make, apparently, one mean ol’ waffle cake. I was thinking about these brown butter, buttermilk, and maple waffles I came up with a while back. And then I was wondering Why aren’t there more waffle cakes?! I couldn’t really understand it. In this Pinterest age of crafty mom’s & food bloggers such as myself galore… you’d think there’d be waaaay more waffle cakes. So. I’m hoping to help y’all out with that. & get a waffle cake fever going. Because this cake. It is rad. And aren’t brunch themed weddings a thing now? Well, they should be a thing. And this should be the cake for that thing. Waffle wedding cake? Or just breakfast of champions? Do what you want! I was going to make maple syrup swiss buttercream, but I didn’t have enough maple syrup to go ’round the waffles & icing. So. I was all Sorghum! My best friend! Thank the lord I’m out of syrup! And then I felt proud and puffy, even if the idea was of necessity. Mother of invention, y’all. My fetish for Southern ingredients is no secret. I’m not in the closet about it. And besides Sequatchie Cove sorghum is unreal. It comes in a mason jar with a handwritten label, and it’s thicker and tangier than anything I’ve ever found at a store. It’s like candy straight out of the jar. Dip some figs in it sometime if you have the chance. Or your finger. That’s good too. Just don’t eat the finger. Sometimes I bite my fingers, like really bite them hard when I’m eating & really hungry. Then I feel shame faced. Like a little ravenous animal. I’ve always found American buttercream to be, eh, underwhelming. But I foresee a whole, whole lot of meringue buttercream in my future. The reason it appeals to me so very much is a) superior texture and b) because I can pour a boiling 2/3 cup of whatever flavored syrup I want into it, and I’m obsessed with what I like to call “blank slate” recipes. Recipes that are basically canvases on which you can paint with whatever flavors you come up with. This meringue buttercream is one of those. It’s actually kind of similar to making marshmallows, in my experience. One more brief thing before I give you the goods. I said I was going to talk about Masterchef, that little thing I was up to all winter during my conspicuous absence from this space. So I’ll say this: yep, I did that thing, and I’m quite proud of myself for somehow managing to get that far! It was exceptionally hard, and when the time came for me to go home I was standing up there praying. Not praying that they let me stay. Praying that they send me home. I couldn’t have stood being there another day. My inspiration for cooking comes from family, a land, a place, a time. A table. Real life. I don’t rush, and I’ve never wanted to be a chef on the line. I like to take my time, enjoy company, slow cook, experiment. I’m a recipe developer, not a restaurant chef. And thank God for the latter, because I don’t want to do what they do. But I like eating what they do! I plan to write books full of beautiful recipes to share with you all, not open a restaurant. But the competition wasn’t the hard part, the competition wasn’t why I was praying to go home. Everything that you go through off camera, that’s the hard part. The competition part is a little farcical, a theatrical joke (albeit a very, very stressful joke). But isolation and exhaustion are very real. I’m a better cook for having been on Masterchef, that’s certain. But most of my experience there seemed to have little to do with cooking even when we were cooking. I remember kind of thinking it was silly when Stacey (a contestant from the season before me) said that she woke up everyday and told herself she was a warrior. I was all It’s a cooking show! Warrior…hahahah! But now I understand. Boy, do I ever understand. It’s a psychological wringer, guys. You have no idea. I’m grateful for having done the show, my personal opinions of it notwithstanding. Every opportunity is what you make it, and it was a huge opportunity. But I’m also so glad it’s all over. Because when people say “Well, it’s TV” you know what they mean, and it isn’t really good. “It’s TV” is a euphemism for being sensational to generate ratings. And I’m glad my part with all of that is over. I’m not against television at large, and as a matter of fact I have secret (ok, not so secret) aspiration to be the female Anthony Bourdain. But turns out I like being on network reality television about as much as I like watching it. Which is not very much at all. Also, the “fresh over” thing? Please. Just, please. Lastly for those of you watching the show that keep googling things like “beth kirby drugs” due to the editing non-sequitur in my final episode where I mention “getting clean”… yeah. Yep. Yes. Did ’em. Lots. It was a problem. Big one. Quit two years ago! Life good now. Much better, kthx….Now I have a life filled with things like waffle cake! So kids, remember: Don’t do drugs. Bake cakes instead. Trust me on this one. Trust me. For more on that, this post might be illuminating. Don't know how to brown butter? The Kitchn tells you how here. Mix all dry ingredients well with a whisk in a large mixing bowl. Make sure all wet ingredients are at room temperature and whisk together to combine in a medium mixing bowl. Stir wet ingredients into dry gently to just combine. Don't overmix or your waffles will be tough. I like to let the batter sit about 30 minutes before cooking. During this time heat your waffle iron & make your buttercream. Mix egg whites, cream of tartar, and salt in the bowl of an electric mixer fitted with the whisk attachment on medium speed until they hold soft peaks. Add in the sugar one teaspoon at a time, beating, until they just hold stiff peaks. Boil the syrup without stirring in a small sauce pan with a candy thermometer attached until it reaches 238°F-242°F on the thermometer. Immediately remove from heat and stream down side of bowl into egg whites, beating constantly on high. Beat until meringue is cool, 6-10 minutes of more depending on how warm your kitchen is. **This is important. If the meringue is at all warm when you add the butter it will melt and become soupy. You can save it by chilling the bowl before continuing. If you add all the butter and it's too soupy, stick in the freezer for about 5 minutes, whip, then set in the fridge for another 10-20 minutes. Whip again until normal consistency. Add the butter one tablespoon at a time beating well between additions. If mixture looks curdled, just keep beating, it will come together. Buttercream can be made up to one week ahead chilled and covered. To revive just bring to room tip and whip back to life with your mixer. Pour two ladles of batter onto your well oiled waffle iron. Cook for 4 minutes or until golden and cooked through. Cook on a cooling rack. Continue cooking until all waffles are done. I like to then chill them for about 10 minutes in the freezer before proceeding just to make sure the icing doesn't get melty. belated happy birthday – that is a magnificent looking cake! and congratulations on the getting clean, you should feel very proud for having done such a strong and loving thing. Happy belated birthday. I totally know what you mean about turning 30 – my birthday is in a couple of months and I can’t wait. I’m so done with my 20s and looking forward to what the next decade will bring. Also, totally obsessed with swiss meringue buttercream at the moment. I don’t think I can ever go back now that I’ve tasted it’s soft and fluffy delights. Happy birthday. 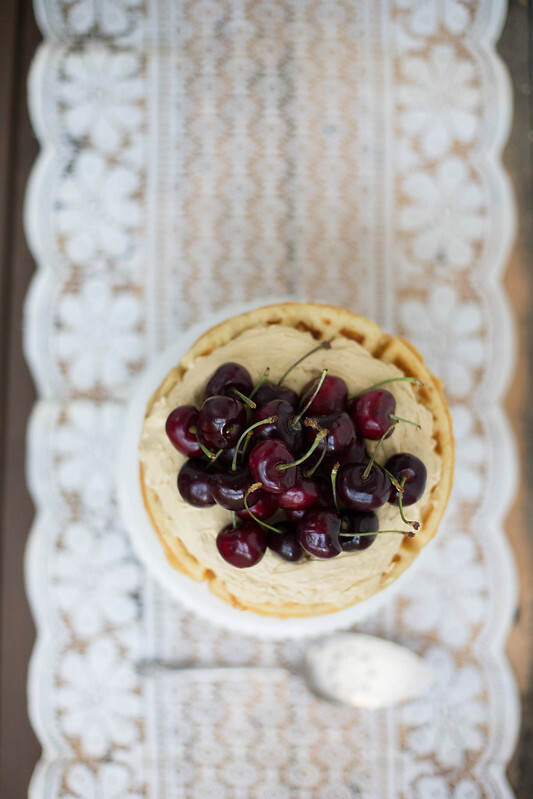 This looks beyond delicious, particularly with those cherries on top, and the photography is stunning. Happy birthday. I agree with you in every single word about Master Chef show. I think It is good but I like enjoying my time cooking not getting stressed in a professional kitchen. That’s not for people like us who prefers get relaxed in the kitchen while cooking something nice. This sounds like the perfect birthday cake to me! Love that frosting on the waffles – maaaaan oh man. Also, Happy belated! Seriously, you and your cakes. Genius. And such gorgeous photographs. Cheers to the transition into a new decade. It’s wonderful to hear how eager you’ve been to reach 30–still in my 20s, trying to build a life of meaning and intention, and at the same time am feeling the pull of everything you mentioned occurring in your own 20s. Knowing there’s more in store (in a good way) is very reassuring. As for the cake: lovely. This post made me both laugh, smile and nod appreciatively. Welcome to the 30s, girl. From one year in over here, I’ll tell you they’re pretty sweet. Sorghum is a favorite preoccupation of mine, so this buttercream—almost exclusively sorghum-sweetened!—makes me happy. I’ve spread the news around. :-> Thank you! What on earth is sorghum? I have never heard of it and wonder if we Brits can buy it over here. Also, I read the post you wrote in January. I happen to have first hand experience of addiction – my partner had a gambling addiction and it took us splitting up and him losing everything and hitting rock bottom to turn his life around. But he did and he got the best girl he ever had back too (big wink) so your right it can be done. I have the upmost respect for you and for sharing your story. I hope it gives hope to anyone who might be reading and is affected or knows someone affected by addiction hope that life can change for the better. Beautiful photos! I just want to bite into this waffle cake! You know that you are the one who sucked me into MasterChef and I must admit I’ve become quite addicted and have now watched all the back seasons; but yes, I completely agree that the theatre of it is farcical and over the top. “It’s TV” indeed. And to the several friends who have said, “You should totally do that!” I reply, quickly, “Oh God, no.” I am the most leisurely cook in the world: I can hardly think of any really fantastic food that I can whip up in only an hour. And – I’ve worked in professional kitchens (as wait staff). I have zero desire to be a line cook or a “real” chef. It sort of makes me wish that there was a competition for home cooks who just like competition and want to learn, but don’t give two figs about “restaurant” food. Lastly – you are so right. The 20’s are mostly the pits. The 30’s rock. The 40’s are even better. You have so much to look forward to. Happy Birthday! Waffle cake!! What a perfect idea! I may have to keep this on the back burner for our birthday week in October. ALL WAFFLES ALL THE TIME. Happy Belated! 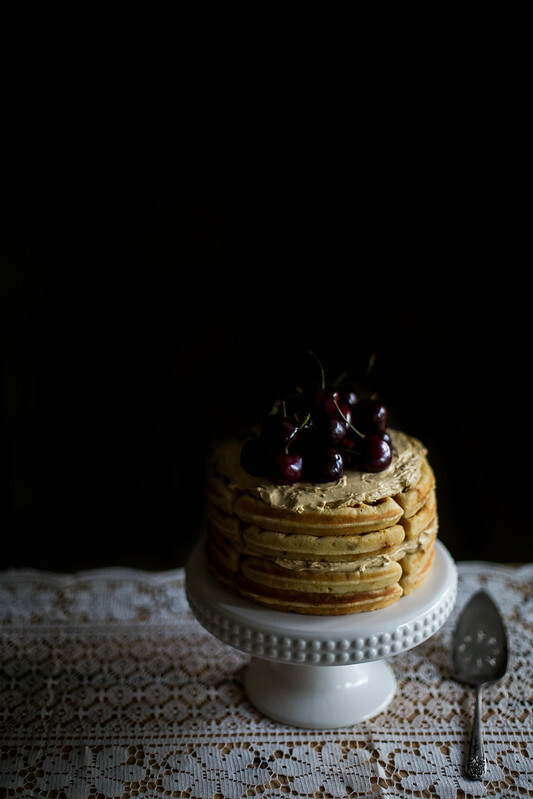 and Wow is that waffle cake photogenic! Hope you had a wonderful birthday!! That cake looks amazinggggg…that buttercream?! Ah! I’m practically drooling!! Thank you for the recipe. Your photos are beautiful! oh, this cake! & i love that you left the stems on the cherries, so perfect. i want it all. Happy Birthday Beth! It was a beautiful post and absolutely love your honesty. Happy birthday Beth, I like the look of this waffle cake in a gluten-free version. I haven’t come across sorghum syrup in New Zealand but I imagine apple syrup would work OK. Enjoy your 30’s, they are SO much better than the confusing and rather frustrating 20’s. And love love your photography, so inspiring. Off to pin some of these pic now for inspiration. Happy birthday Beth! I literally just now put two and two together – I love MasterChef and have been watching the recent season on Hulu, but just now realized that you were the Beth from Tennessee on it! You did such a great job and you should be proud! 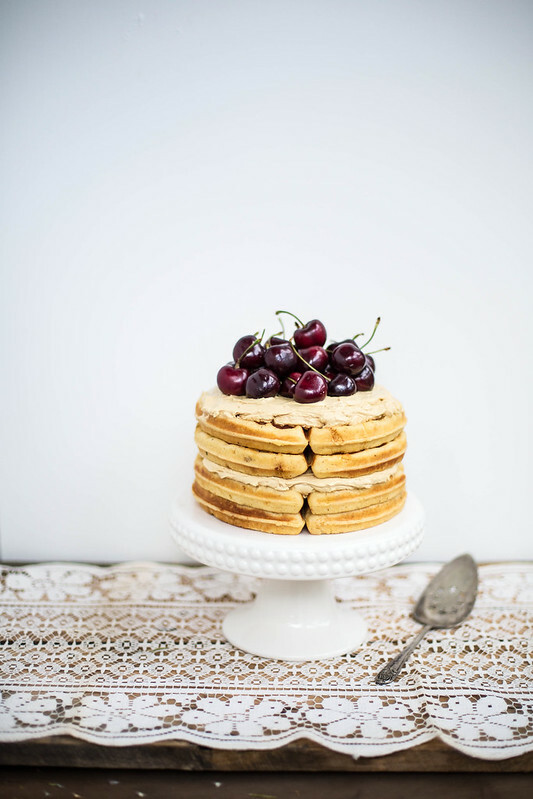 Fantastic post – this waffle cake sounds delicious! Cheers! Happy birthday Beth! i really enjoy reading your posts, seeing the wonderful photos you take, and learning new recipes, but what i really really love about this blog is your honesty. Thank you for sharing so much with your readers, you sure are an inspiration! Happy birthday Beth. Your blog (and you) are an inspiration and I’m sure a lot of people have been helped by your honesty. Here’s to the next two years (and more) of happiness! be oh so blessed. you are an inspiration. I hate those cooking shows. They have ruined everything about good food. I want things to be quiet, and enjoyable, not hectic like some chaotic food fight. I want them to tell me how they squeezed a little more flavor out of a recipe, or what they did to raise the level of the food, and not use fruitloops for a secret ingredient. Ok, just my 2 cents. These look so good! 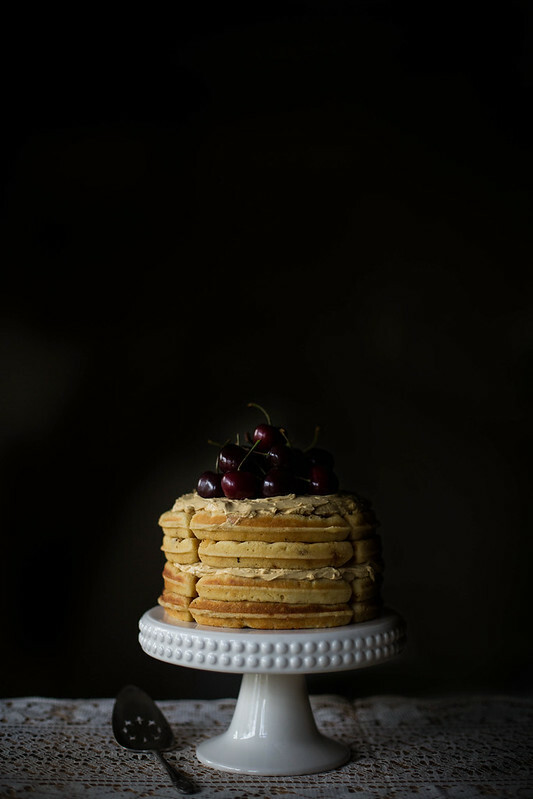 I haven’t had waffles in so long – waffle cake is so creative! I love the fresh cherries on top. Happy Birthday Beth! 30 is a good one and I hope it continues to bring beautiful gifts your way. I can sooooo relate to the horror show that was your twenties. It’s funny you mentioned the Googling because if you head just a few pages back in my Google history, you might catch a mugshot or two. I always wonder who gets that far past my bylines. No one has mentioned it yet. I guess it’s true what they say. We will not regret the past nor wish to shut the door on it. Dope waffle cake. I’ll eat that in one sitting. Waving my pom poms over here for you, Beth! Happy Birthday, of course, but high fives for the years behind you that made you the fantastic and evocative and beautiful woman you are now, and for the woman you’re still becoming. I’m a fan. Dear Beth firstly I would love to wish you a happy bday I’m 28 this year so don’t feel old I’m soon be in the 30 length now I wish for a time machine… Secondly I really love the way you turn a breakfast meal to a cake although I’m banned from baking cause my mom worries that I destroy the house with my baking… But it’s awesome to see something so easy turn into a lovely dish. I cried when I turned 30 and laughed when I turned 40. May this year bring you wonders never ceasing. Thanks for this wonderful treat using sourghum. I was raised using sourgum in various dishes and I look forward to trying this one. Also, your eye for photography is amazing. Cheers! Wow. I just found your blog. You must write more. 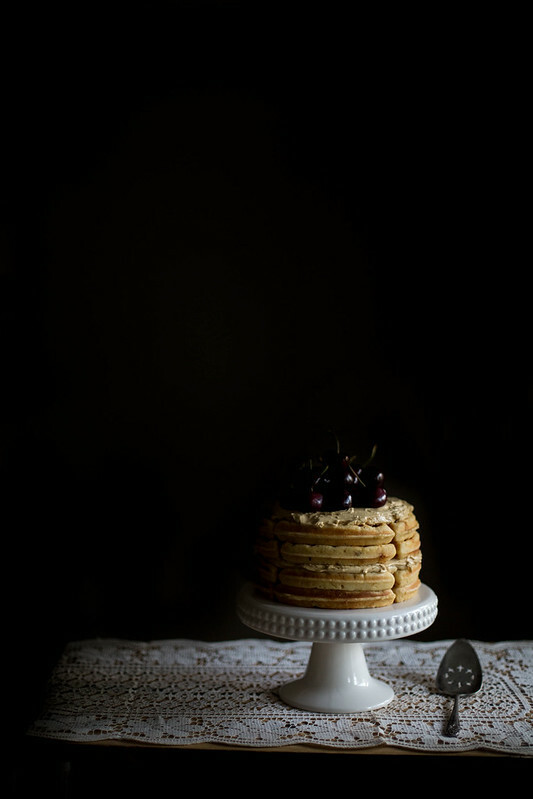 I love the cakeplate, have been looking for one a long time but they’re so expensive.. Happy belated!! 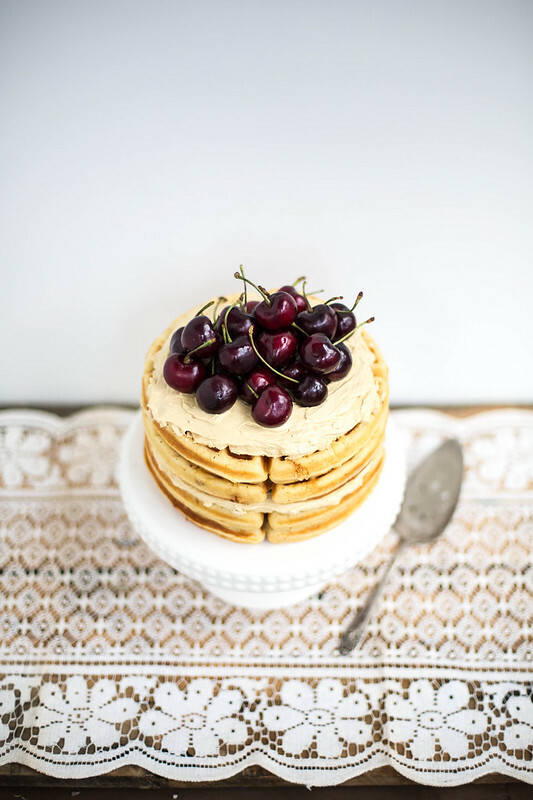 looooove this waffle cake…it’s a total dream. Happy belated birthday! 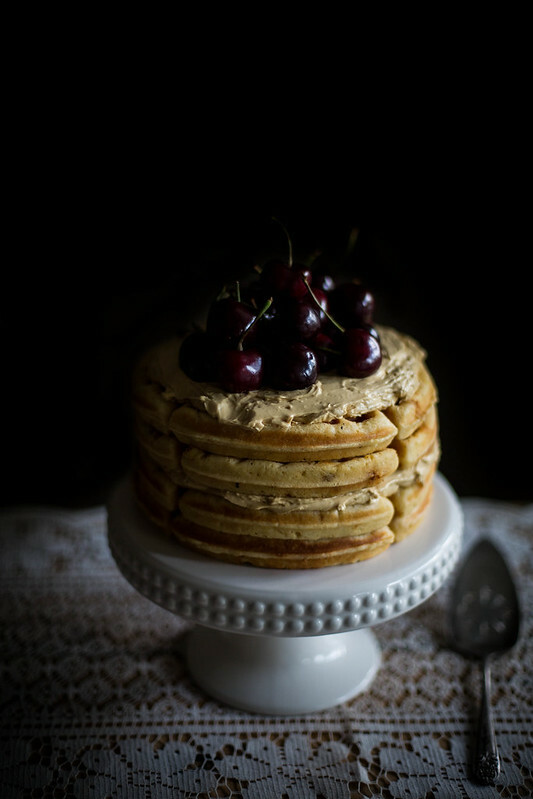 Your waffle cake is genius! A wedding waffle cake would be amazing. Your blog is just absolutely so beautiful and inspiring and your photographs – wow! Can’t believe I’ve only just discovered it and I’m so excited to curl up and go through the backlog. Wow, these are gorgeous! I’m sure they taste as spectacular as they look! I just found your blog and I’m so excited. You seem to have an awesome head on your shoulders. I’ve never seen Masterchef, but it’s interesting to hear you talk about it. I always think that people who have tried something, and “failed” (even though it might not really be actual failure) are way more interesting and strong that people who succeed at the first go. I can’t wait to read more of your stuff! And happy birthday!